Ugh. 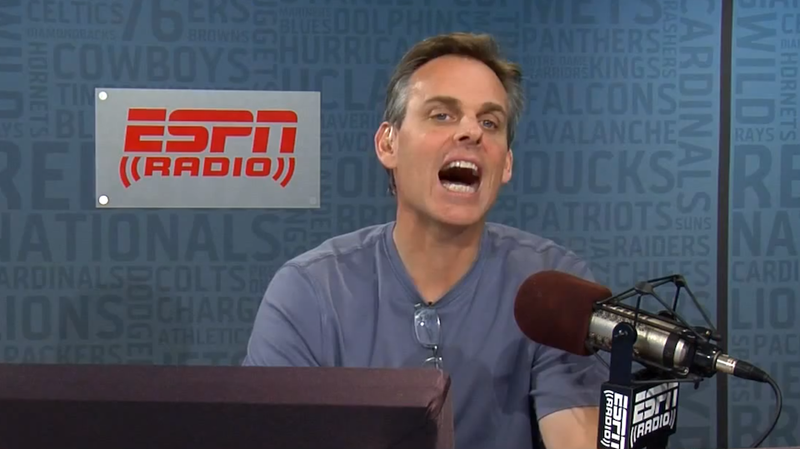 Colin Cowherd Is (Statistically) The Best Pundit Of 2012. Coming into 2012, we expected that our inaugural award for Best Pundit of the Year would likely go to a political pundit. However, as we have reviewed at length, that pundit community turned in an awful election season. There were a few bright spots, including Nate Silver, although we have argued that the performance of the quants has been overhyped by the media. Chris Cillizza of the Washington Post merits an honorable mention, as he picked Obama to win the election and nailed the final tally for the House of Representatives. Moreover, Cillizza's prediction that John Kerry would be the new Secretary of State and that Scott Brown would take Kerry's spot in the Senate now looks quite possible (click here for Cillizza's full list of predictions). Turning to finance, our recent recaps of their 2012 prediction lists revealed that none of the financial pundits did particularly well, although Marc Faber and Mario Gabelli deserve credit for their impressive investment picks. In the end, we concluded that the Best Pundit of 2012 award should go to a sports pundit, one who has demonstrated terrific game-picking prowess this year. That pundit is Colin Cowherd of ESPN. The Bears Super Bowl prediction looks dicey at the moment, but overall, Cowherd's pre-season picks are looking quite strong. For a full breakdown of Cowherd's predictions, click here to visit his PunditTracker profile page.